This dead wedge review will introduce you to the Dead Wedge Deadlift Jack. The Dead Wedge is an option that every deadlifter should be aware of. While I was in the gym the other day, I noticed a guy deadlifting over 225 pounds. However, he appeared to be struggling way more with changing weights than his actual workout. I wondered if there was an easier way to load and unload the weights. I found out that there are deadlift jacks which help you to load and unload weights. I started shopping around and comparing deadlift jacks which is how I ended up writing this dead wedge review. The Dead Wedge for Your Gym Bag – Raises loaded barbell & plates for effortless Loading/Unloading. Perfect for Powerlifting, Weightlifting, Crossfit, Home Gym & Deadlifts. Based on comparison and over 407 5 star reviews (wow), I select the Dead Wedge as an excellent choice. The Dead Wedge benefits a deadlifter especially when there are four or more 45 pound plates on the bar which comes out to 225 pounds or more in weight. Seasoned deadlifters have reviewed the Dead Wedge as being absolutely necessary for 315 pounds or more which is at least six 45 pound plates on the bar. Further, the Dead Wedge benefits any weight training which requires loading or unloading the bar while it is on the floor like deadlifts or barbell rows. So, if you are already deadlifting 225 pounds or more or hoping to, read on to learn more about the advantages of having a dead wedge in your gym bag. 1. Save strength, time and energy for deadlifting instead of using up strength and energy struggling to load/unload weights. 2. The Dead Wedge is an important deadlift accessory for safety in a home gym when you do not have anyone else around to help you add or take off weights. 3. In addition, a dead wedge can help to protect your back from injury when loading/unloading weight when the bar is directly on the floor and not elevated. 4. Most gyms do not have a Dead Wedge, so having your own dead wedge will come in handy. 5. A Dead Wedge is more stable than using 2.5 or 5lb plates to lift the deadlift bar a bit since the weights typically roll off of those small plates. Why is the Dead Wedge so Popular? Why is the Dead Wedge the best deadlift jack currently on the market? 4. Economical at up to a tenth of the cost of other deadlift jacks which are noted further on. 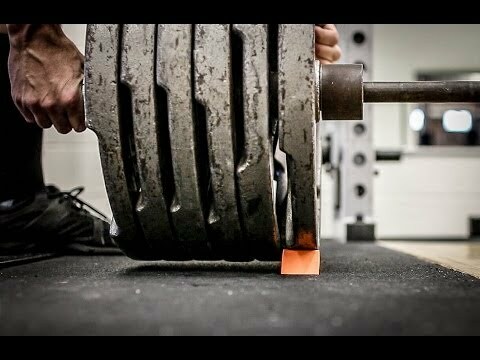 If you’re like other deadlifters out there who struggle with loading and unloading plates from the bar and you are looking for a solution, consider trying out the Dead Wedge. The Dead Wedge comes with a 100% money-back guarantee with no hassles if you are not fully satisfied. If you try it and don’t like it, return it. 1. Roll the innermost plate on top of the dead wedge and the bar will remain in the right position to load or unload additional plates without the barbell rolling or moving around. 2. Remember to roll the bar with one plate onto the dead wedge and then to add or remove 45 pound plates. 3. Do not try to lift the bar with plates onto the dead wedge, it will not be as comfortable or easy. 4. Most users think that having two dead wedges will make things easier so that you can load and unload weights on both sides of the bar easily. 5. Roll it on to add or remove weight, then roll it off and do your deadlifts.